Artist Jon Tarry is known for his statues and art installations (including one at Curtin Gallery as part of PIAF). But on Monday night he was sculpting sound. The UWA associate professor was centre stage at Chevron Festival Gardens for a music and art collaboration called Dark Mirror White Noise. 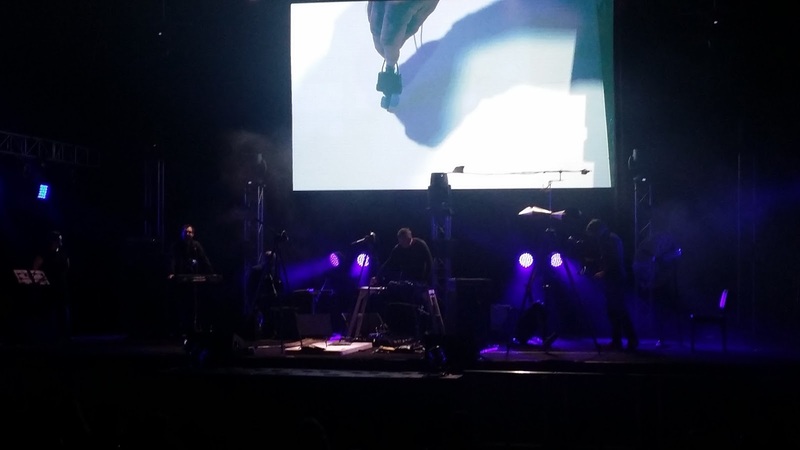 Tarry introduced the intersection of sound and image from the beginning of his 50 minute improvisation by using an interactive pad and pen (with pickup mic attached) to literally draw sound. The pen movement stimulated electronic sounds and the scribbles were projected onto a screen. Tarry electronically manipulated the white noise to become low, subterranean globs of sound which his ensemble began to interact with. Peter Knight added high pitched (and somewhat intrusive) computer generated samples plus trumpet calls that he distorted to haunting effect. Vocalist Esther Maria brought a cabaret/operatic vibe to the performance with fragments of poetry delivered in Danish and English. Sam Pankhurst filled out the bottom end of the sound spectrum with his synthesizer and ‘geobass”, a wire suspended from the roof which he played with a bow to produce whispers and shivers. Cameron Robbins took the cake in terms of visually compelling music making. He began on bass clarinet, interacting with Tarry’s scribbles with wriggling note clusters and multiphonic keening before returning to the stage with a “Fractal horn”, a tube with an extended bell which projected long slow tones over the audience. Then there was the metal swan extending on the arm of a wind gauge and activated by an industrial fan. Robbins also had his own mechanically operated drawing machine with an amplified pen which ricocheted between obstacles and generated a percussive beat. Robbins added a didgeridoo-like pulse on his clarinet, hair streaming out in the wind from the fan while the swan danced wildly above him. It was an incongruous and compelling mix of lo-fi and high brow art. The performance wasn’t what everyone expected and there were a few walk outs. I had anticipated film work and a broader exploration of sound-generated visuals. Instead the show was more of a live installation performance. But for those who stayed it was an engrossing display of a group of artists’ limitless capacity for musical invention.